Note: N in above was 8, tried to submit and it entered a emoticon? No matter what I change the glRotate commands to, get the same thing, a vertical and a horizontal line on the output, no Z axis and had addition curve date yet did not plot the curve. Have this identical program in C++ works great??? Sid, you should probably delete this DUPLICATE version of your post or you'll get replies on both ! I have not tested your program but a quick glance shows %1w instead of %lw. I spotted that too Paul . ... and for me it resulted in just a blank black window appearing, no lines at all. Sid, I'm not familiar with OpenGL commands and how you have to set up the graphic space. but half the time I struggle with what the commands mean. I do notice though that the points (vertices) you're using all appear to be (0.,0.,0.) (you set arrays X,Y and Z to be zero) ! which would explain why I got nothing on screen if it's just plotting zero length lines as the points co-incide ! Am I right in deducing that you're expecting 7 lines to be plotted ? .... in a 'co-ordinate space' which is rotated 22 deg. about each axis ? I presume the 2 lines you're seeing are 2 of the 'axes' but it's not clear. And I get nothing running the code listed above. I'm running Win7 btw but why that should affect things relative to your Win10 I couldn't imagine. So Frustrated with this system, cannot post a screen shot so have to type in every line of code and other statements whenever I want to ask question ! BOO bad system! 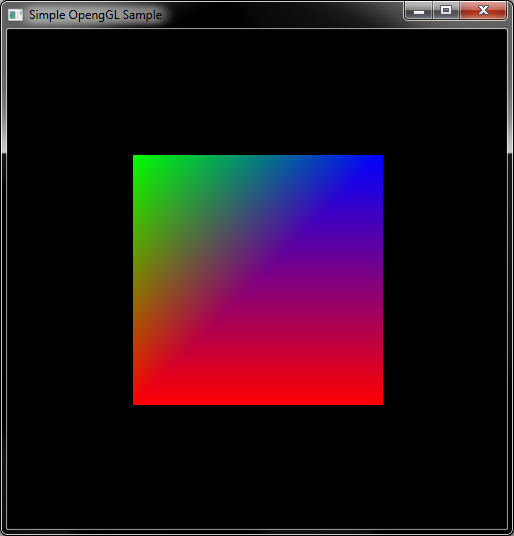 There is also another opengl example which shows you some rotations. In general, I prefer to use SCC, because in the internet more useful examples are written in C++. First you should read some simple opengl manuals and understand how opengl works in the basic structure. I presume this is what you were expecting Sid ? I dug around a few old forum posts and made a couple of changes/additions. Don’t quote me but I think the solution was the moving of the rotations commands (glrotatef) outside the ‘glBegin / glEnd’ area of the code. This hint was given by Ian Lambley in an old post where he was trying out opengl and made the comment relating to a different command. It seems opengl has a certain ‘hierarchy’ of commands placement, you just can’t place them where you want to. Note I also combined the 3 glrotatef’s into one. That might potentially have created a slightly different ‘axes’ orientation to the one you are aiming for. PS – everyone’s jumped through the ‘how to post pics on the forums’ loop a few times ! I’ll post a guide shortly for you (and future newcomers) to cover that. Remember we’re all learning with you here about opengl as it’s not used much. Ian Lambley and DanRRight being the at the forefront brave ones that I've seen have delved into it’s murky depths in the past. There may be others amongst the 'silent majority' of the 1000+ registered users but they only pop out of the woodwork sporadically). That really needs to be encouraged to change. Sorry, I see you too got the code working, well done. How did you manage it ? Was it different to how I did it (above) ? For your "zig zag lines all over the place" code, you need to post the code ! for us to be able to try to help. I didn't understand you're comment about why you can't paste code to the forum. To do that 'copy' from your source file, put the cursor in the 'reply' edit box, then click on the 'code' button first, then 'paste' the copied code, THEN click the 'code' button again which will 'terminate' the designation as code. Your code will appear in a whte background box. Thn continue with any other comments. Instructions for posting screenshots I'll post seperately.